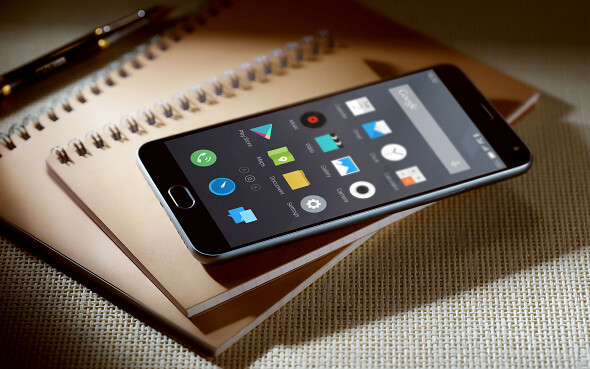 Meizu just pulled the wraps off the successor to the popular m1 note. Priced equally to the predecessor at CNY999 (~$160), the new Meizu m2 note packs even more bang for the buck. The phablet is built around a 5.5-inch FullHD display, which utilizes a Sharp-made IGZO panel. Meizu claims a 1000:1 contrast ratio and 450 nits of brightness. The Meizu m2 note is equipped with the updated version to Mediatek's midrange MT6752 chipset. The minor bump in the numeral to MT6753 means support for a wider range of bands for a global 4G coverage. The Cat.4 LTE promises download speeds up to 150Mbps. The SoC packs an octa-core Cortex-A53 processor, clocked at 1.3GHz and a Mali-T720 MP3 GPU ticking at 450MHz. RAM remains at 2GB as in the predecessor and built-in storage is 32GB, though a carrier-specific 16GB option will be available, priced even lower at CNY799 (~$130). You're no longer limited to internal storage though, as the m2 note now comes with a microSD slot for expansion. It is, however, of our less favorite type, as it is shared with the second SIM slot, so you can't have both at the same time. The m2 note comes with a 13MP primary camera which uses a Samsung-made CMOS sensor. It’s housed behind a five-element f/2.2 lens, protected by Gorilla Glass 3. On the front you get a 5MP snapper with a 69° f/2.0 lens. The body is mostly the same glossy polycarbonate affair, though a more restrained gray version has also appeared. A few design tweaks promise improvements in user interaction. The power button has been moved to the side for easier access and the capacitive home button has made way for a physical button. The control layout in the smartphone's specsheet calls it an "mBack" button, but we're yet to see what that actually translates to. The new phone measures 150.9 x 75.2 x 8.7mm, which is basically the same as the predecessor, and weighs 4g more for a total of 149g. Battery capacity has been marginally lowered, but 3,100mAh versus 3,140mAh would hardly be felt in real life. This is a question..... Meizu M2 note supports with indian bands? Band 40 band 3 etc... If this not supporting then this phone may be wait in India. If in mobil seprate memory slot.